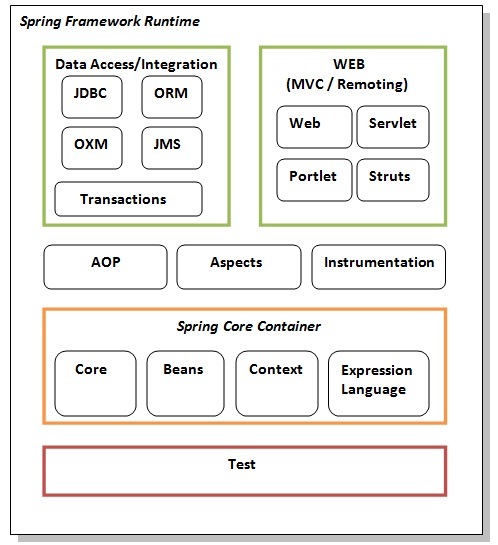 The Spring framework comprises of many modules such as core, beans, context, expression language, AOP, Aspects, Instrumentation, JDBC, ORM, OXM, JMS, Transaction, Web, Servlet, Struts etc. These modules are grouped into Test, Core Container, AOP, Aspects, Instrumentation, Data Access / Integration, Web (MVC / Remoting) as displayed in the following diagram. This layer provides support of testing with JUnit and TestNG. The Spring Core container contains core, beans, context and expression language (EL) modules. These modules provide IOC and Dependency Injection features. This module supports internationalization (I18N), EJB, JMS, Basic Remoting. It is an extension to the EL defined in JSP. It provides support to setting and getting property values, method invocation, accessing collections and indexers, named variables, logical and arithmetic operators, retrieval of objects by name etc. These modules support aspect oriented programming implementation where you can use Advices, Pointcuts etc. to decouple the code. The aspects module provides support to integration with AspectJ. The instrumentation module provides support to class instrumentation and classloader implementations. This group comprises of JDBC, ORM, OXM, JMS and Transaction modules. These modules basically provide support to interact with the database. This group comprises of Web, Web-Servlet, Web-Struts and Web-Portlet. These modules provide support to create web application.